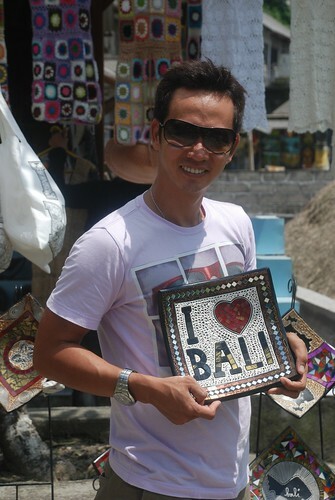 My first time in Bali meant many first experiences. Bali is a popular place for Aussie tourists as it is pretty close to Australia and there are many great deals from Garuda Airlines, direct and cheap. A lot of Aussie guys and girls love surfing and I didn't want to miss out so I took a lesson from Ketut, a young experienced local surfer on the beach. He charged $20 a lesson which was much cheaper than the expensive schools further along the beach. 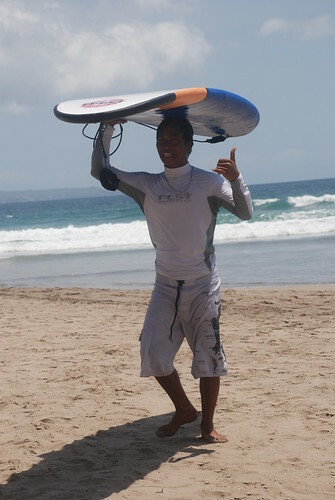 Finally, after some training on the sand, we entered the water and after a few wipe outs, I managed to stand up. I surfed! On the last day of our holiday, I went back to the beach again to have another practice. This guy Ketut is also a fake-tattoo artist so I got a tattoo on my arm as well. He is definitely a jack of all trades. 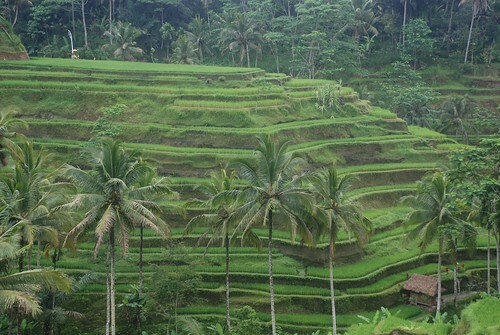 My second experience was a bike ride arranged by an Ubud gym. Wayan, one of the gym instructors, was on the duty for our ride from the mountainous Kintamani region back to Ubud. It was fun and we had such a great time. Along the 25km route, we stopped at quite a few different places. At a coffee plantation, we tasted coffee with vanilla, chocolate, and ginger as well as some teas. Later down the hill, we visited a carving village and the guy explained the way Balinese carve their gods and other products. Some of their big carvings take an amazing 6 months to complete but the income doesn't seem to match the time they put in. We also rode through the incredibly green rice fields and had lunch at a very small local restaurant. The young chef served us amazing traditional Balinese food and it turned out only $20 for 5 people including beers and soft drink. The bike trip was a real highlight. 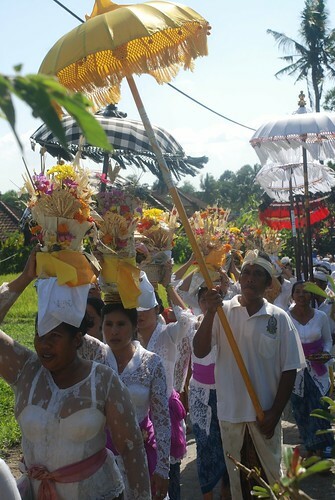 The third experience was the Balinese dancing at the palace near the market in Ubud. What was very impressive to me about the way they dance is the movement of their eyes rolling around, their dresses and also the amazing gamelan music. It was quite a moving experience and I was very impressed by the way the Balinese not only promote their traditions to tourists but also the way they seem to live their unique culture every day. I will definitely be making another trip to Bali some day because apart from all the things to do, it is also possible to really relax there. Van Cong Tu is a food blogger and local hospitality industry insider from Nha Trang currently living in Hanoi. He has an enormous passion for his country's food and culture. Tu's blog, cheekily named Vietnamese God, is where he started to document his food and culture adventures in 2005. Tu's quirky observations also found their way into Pathfinder magazine and Vietnam's TimeOut. Tu's experience managing some of Hanoi's finest dining establishments along with his special interest in street-food (he's shared many hours trawling the street stalls and markets with stickyrice blogger, Mark Lowerson) make him the genuine, local authority on Hanoi's food scene.